Are you ready to build your buyer persona expertise and be recognized for your accomplishment? Attend our online workshop to learn the industry's #1 method for gaining actionable insight into buying decisions and the people who make them. Within a few hours, you can acquire the skills and knowledge required for certification as a Buyer Persona Subject Matter Expert. Have you noticed how many companies are seeking marketing professionals who understand buyer personas? To help you earn the recognition you so richly deserve, we offer an online knowledge assessment at the conclusion of the workshop. You won’t want to miss this opportunity to assess your new learning and display a Buyer Persona Subject Matter Expert badge on your resume or LinkedIn profile. Learn the industry’s #1 method and become a buyer persona expert. Your methodology allowed us to bring a lot more value to Deloitte, which is one of our most important clients. Instead of speculation we know what buyers want and how they make decisions, critical insights that guide our messaging, marketing content and much more for all of our clients. Thank you for the great process and for helping me add new skills to my portfolio. Am I ever happy to have found you. I would LOVE to build buyer personas at my company. In a past role, I developed rudimentary personas for a website relaunch that made the final site so much better. Though I have challenges to overcome at my current company, your materials will help me show gaps and prepare to pitch for executive buy-in. Plus, real content marketing is my goal. You make the path to success so much clearer!! Thank you. Thank you so much! I'm really enjoying your method. It's simple and I can see how valuable it will be when it comes to developing the key messages and themes to be used in marketing. I can already tell that I'm going to feel a lot more confident about my recommendations. At the start of the process, I was saying to myself "I can save some $$ by not doing the interviews"—now I wouldn't ever consider doing it w/o interviews!! I want to thank you for the Buyer Persona training and a book which was/is an invaluable tool guide. I've learned a great deal about the power, process and findings of Buyer Personas due to all your hard work throughout the years. I just listened to your great online training about "Buyer Personas". Thanks a lot for the many hands on tips. I really loved your email templates and introductory sentences to invite potential interview partners. I've been very impressed with your webinar and find the information very useful. We're a digital agency and have been working with clients to understand triggers and the process the buyer goes through to find a solution for a while now. But we haven't done the qualitative type of research you are presenting which will be extremely valuable to the process. Thank you! I have conducted a few buyer persona studies based on Adele Revella's book, and I cannot stress the importance of this type of study enough. Now, taking this workshop, I am more confident than ever. The resources and training I received from this course are priceless! I can’t wait to report back to my stakeholders. There's only one person and organization I recommend when you're developing your competency in persona development. 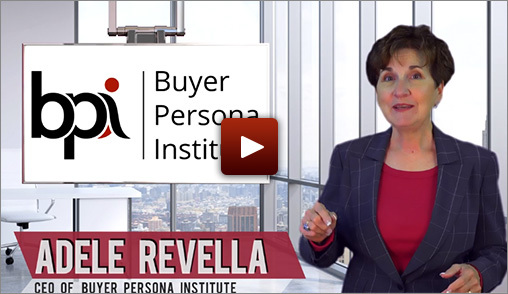 That's Adele Revella and the Buyer Persona Institute. After this workshop, I had the confidence to pitch the buyer persona project to our stakeholders and everyone was convinced this is a valuable addition to mapping the customer journey. We have a unique relationship with our customers and prospects and there is a sense that we know everything about them... but there were a lot of gaps in our insight which the buyer persona interviews filled. I would highly recommend this workshop to anyone looking to know more about your buyers. 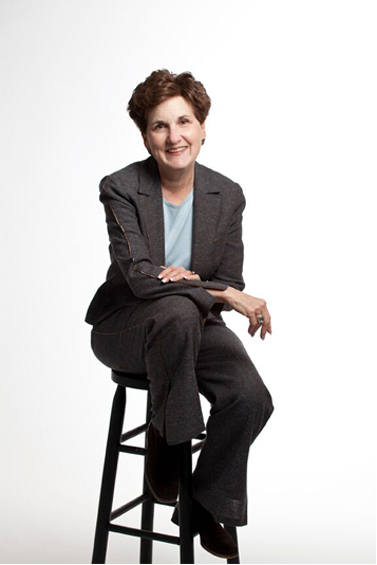 And who better to learn about buyer personas from than the person who wrote the book! In this workshop overview, we'll explain the importance of building buyer personas around the buying experience. You’ll understand why buyer profiles that merely describe the buyer result in too many personas and not nearly enough actionable insight. Learn about the critical insights that define your persona's decision to evaluate a solution like yours. We'll help you differentiate each of these categories of insight and explain how you can use them to deliver the sales and marketing interactions your buyers are seeking. Learn which buyers you need to interview and how many interviews you will want to conduct. We'll also explain the steps required for a segmented study, which reveals how many personas you need based on differences in your buyers’ approach to their buying decision. To ensure you get the best insights from every interview, we'll help you consider several approaches for finding buyers to interview. We'll also walk you through the techniques you'll use to persuade buyers to agree to meet with you. You'll learn how to interview buyers using our unique method, employing probing techniques that prompt buyers to reveal the perceptions, expectations and attitudes you need to explore. We'll show you how to practice your new skills using our interview guide and example buyer interview, building your confidence and technique before your first live interview. In this module you'll learn how to use our insights template to identify patterns across your interviews and build your buyer persona. You'll see how to choose the most relevant and interesting quotes so that your stakeholders fully comprehend the practical and emotional elements of your persona and their buying decision. If you think you might have multiple buyer personas, this module will show you how to understand and defend the number of personas you truly need. We'll show you how to conduct a segmentation analysis based on differences in each buyer's decision so that every persona is actionable and relevant. In this recorded interview, you’ll learn how to talk to your internal stakeholders or clients about the importance of this unique approach to buyer personas. Adele offers several tips to help you overcome common concerns based on existing buyer knowledge or misperceptions about the value of personas. This workshop is designed for every marketer or sales enablement professional who is responsible for "high consideration" products, services and solutions. Nearly all B2B solutions fall into the high consideration category, as well as those B2C solutions where buyers spend days, weeks, or longer evaluating their options and choosing one. 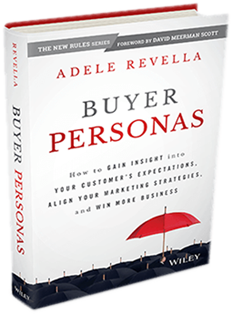 Adele Revella is CEO of Buyer Persona Institute and author of Buyer Personas: How to Gain Insight into Your Customer's Expectations, Align Your Marketing Strategies, and Win More Business (Wiley), named a Top 5 Business Book by Fortune Magazine. Her unique perspective derives from decades of experience as a sales and marketing executive, trainer, researcher and entrepreneur. Adele's inspiration for Buyer Persona Institute emerged as she developed and led the benchmark product marketing course for Pragmatic Marketing, the global training company widely considered the leader in B2B product management workshops. Traveling around the globe to educate thousands of marketers, entrepreneurs and business owners, Adele witnessed the nearly impossible task people encounter when they attempt to influence people and decisions they don’t fully understand. An empathetic person by nature, Adele was distressed to see so many incredibly smart, motivated people allocating their time and budget to activities that made no sense. At the end of one memorable course, a woman burst into tears while describing her frustration. So when Pragmatic Marketing approached Adele to buy her business, Adele was ready to launch her third company (her first was a market research firm in the 80’s). Now, seven years later, Buyer Persona Institute counts among its more than 100 clients some of the smallest and biggest corporations in the world— from startups, consumer brands and tech companies to household names like Caterpillar, HP, Siemens, SAP and Cisco. A three-time SVP of Sales, Marketing and Product Management in tech and related industries, Adele started her career in market research with Regis McKenna, the agency that launched Apple and Intel. Now a resident of the San Juan Islands in the Pacific Northwest, Adele enjoys sea-side living with her husband Steve, Roxy the English Cocker Spaniel, Charlie the Golden Retriever, and Missy the Calico Cat. In this recorded interview, you'll learn how to talk to your internal stakeholders or clients about the importance of this unique approach to buyer personas. Adele offers several tips to help you overcome common concerns based on existing buyer knowledge or misperceptions about the value of personas.